Since I’ve already blogged about Xavier University and the Ateneo de Davao University here way, way before, I figured, why not complete the trio of Mindanao Jesuit schools and feature the Ateneo de Zamboanga University? The main campus of the university is in downtown Zamboanga City while the Tumaga Campus, which houses the High School, is located further upland. The University was founded in 1912, making it the second oldest Jesuit school in the Philippines after the Ateneo de Manila University. 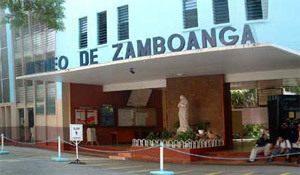 It started as the Escuela Catolica before being renamed as the Ateneo de Zamboanga in 1916. ADZU then became a college in 1952 and in 1976 started offering graduate courses. Finally, it was granted university status on August 20, 2001 by the Commission on Higher Education including full autonomy status, the only such university in Western Mindanao. Photo from the ADZU website. Looking in Google Maps, the university is unmistakable due to the bright blue colors of the roofs of its buildings. As you should know, blue is the official color of the Ateneo schools. Visible in the satellite imagery are the Grade School, High School, and College Buildings, the gymnasium, the chapel, and the Jesuit’s residences. You can correlate the satellite image with this campus map at the Ateneo de Zamboanga website. As always, you can check out its Wikipedia article to get a quick rundown of facts. Hi Eugene, yes you got the facts right. To include some interesting informations the Grade School department will in a few years time follow suit in our Tumaga Campus together with the HIgh School department who’ve been staying there for quite some time now. At present the La Purisima Campus is being housed by the Grade School and College Departments. I still prefer that the elementary and secondary levels be in La Purisima just like back then in our time. And yes, I am a proud alumna of Ateneo de Zamboanga University.